There is a secret ingredient in these which may be surprising, but makes for a very moist, rich finished product. If you're going to make chocolate cake, why not go all out? 1) Sift/mix together flour, cocoa, sugar, and baking soda (dry ingredients). 2) Mix mayonnaise, cold water, and vanilla by HAND. 3) Add liquids to dry. 4) Pour into greased, floured pans; bake at 350 for 25-35 minutes or until toothpick inserted in center comes out clean. 5) While cake is baking, dissolve instant coffee in boiled water and let cool before making icing. 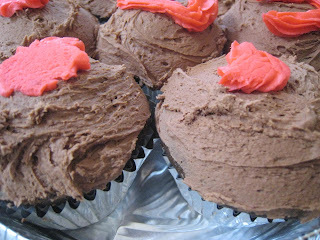 6) Combine icing ingredients with mixer, adding cocoa and sugar as needed to achieve the taste you want. 7) Ice cake when cool.